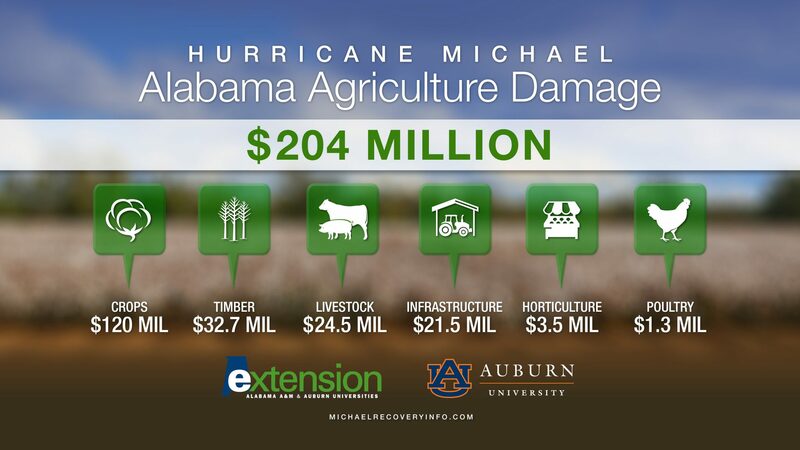 AUBURN UNIVERSITY, Ala.—Hurricane Michael caused almost $204 million in agricultural damage alone as it moved across Alabama. Alabama Cooperative Extension System Director Gary Lemme called it a devastating blow to farmers in the state’s Wiregrass region. Alabama Extension professionals spent the days following Michael evaluating actual losses in eight counties—Barbour, Coffee, Covington, Dale, Geneva, Henry, Houston and Russell. Damage to the region’s more than 200,000 cotton acres reaches almost $108 million. Peanut losses are more than $11 million, while combined losses to corn and soybeans total more than $1.7 million. While farmers did not suffer high livestock deaths, their operations sustained significant harm to fencing. Fence replacement costs total almost $18 million with another $5.6 million in debris removal expenses. The region’s poultry houses weathered the storm better than those in neighboring Georgia. Poultry damages total about $1.4 million. Farm structures including irrigation systems and agribusinesses, such as cotton gins and peanut buying points, took extensive damage as well. 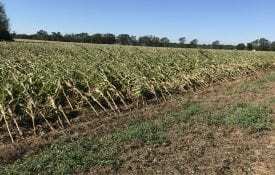 Storms destroyed about 200 center pivot irrigation systems. Damage to those systems alone accounts for $9.6 million, while structural damage on farms and at agribusinesses reaches another $11.9 million. 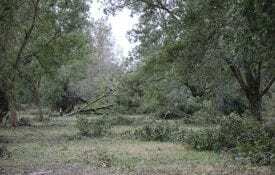 The storm’s high winds ravaged pine forest stands, snapping some trees at midtrunk while toppling others. Destroyed timber is valued at almost $20.9 million. Lemme noted that smaller producers face potentially catastrophic situations. Lemme said Extension staff working with United States Department of Agriculture and agribusiness leaders used a systematic approach to estimate losses. 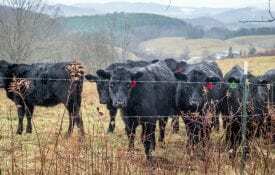 The damages represent the first part of a report Alabama Extension will submit November 1 to local, state and federal officials. Lemme added that the November 1 report will reflect the impact that agricultural losses will have on the region’s overall economic health.